Transient receptor potential cation channel, subfamily V, member 1 (TRPV1) plays a key role in sensing environmental hazards and in enhanced pain sensation following inflammation. A considerable proportion of TRPV1-expressing cells also express transient receptor potential cation channel, subfamily A, member 1 (TRPA1). 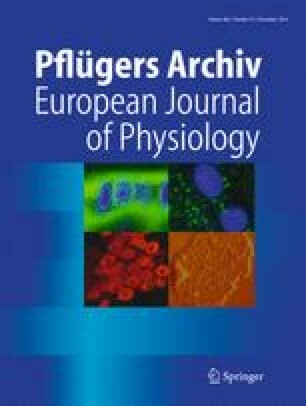 There is evidence for a TRPV1-TRPA1 interaction that is predominantly calcium-dependent, and it has been suggested that the two proteins might form a heteromeric channel. Here, we constructed subunit concatemers to search for direct evidence for such an interaction. We found that a TRPV1::TRPV1 concatemer and TRPV1 formed channels with similar properties. A TRPV1::TRPA1 concatemer was responsive to TRPV1 agonists capsaicin, acidic pH and ethanol, but not to TRPA1 agonists. Isolated TRPV1 and TRPV1::TRPA1 imaged by atomic force microscopy (AFM) both had molecular volumes consistent with the formation of tetrameric channels. Antibodies decorated epitope tags on TRPV1 with a four-fold symmetry, as expected for a homotetramer. In contrast, pairs of antibodies decorated tags on TRPV1::TRPA1 predominantly at 180°, indicating the formation of a channel consisting of two TRPV1::TRPA1 concatemers arranged face to face. TRPV1::TRPA1 was sensitized by PKC activation and could be inhibited by a TRPV1 antagonist. TRPV1::TRPA1 was activated by heat and displayed a threshold and temperature coefficient similar to TRPV1. 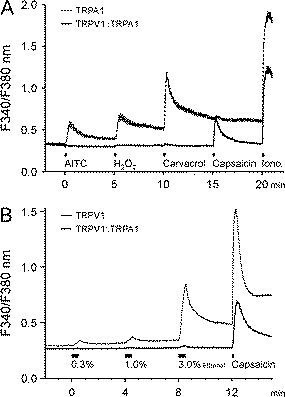 However, the channel formed by TRPV1::TRPA1 has only two binding sites for capsaicin and shows less total current and a smaller capsaicin-induced shift in voltage-dependent gating than TRPV1::TRPV1 or TRPV1. We conclude that the presence of TRPA1 exerts a functional inhibition on TRPV1. The online version of this article (doi: 10.1007/s00424-014-1497-z) contains supplementary material, which is available to authorized users. This work was funded by grants from BBSRC (to PAM), the Newton Trust (to PAM), and Kidney Research UK (to JME). MJMF held a Feodor-Lynen Fellowship. DB holds a David James Bursary from the Department of Pharmacology, University of Cambridge. The authors declare that they have no conflict of interest. The authors declare that the experiments comply with the current laws of the countries in which they were performed. The study does not contain experiments using animals or humans or tissues derived from these. MJMF conceived the study, generated the plasmids, designed, performed and analysed the functional experiments and drafted the manuscript. DB, PJ and TAG performed and analysed the AFM experiments. PAM and PWR helped design experiments and provided critical intellectual support. JME designed atomic force microscopy experiments, interpreted the results, wrote the respective parts of the manuscript and critically revised the manuscript.